Get notified when Cotton Bowl tickets are available! 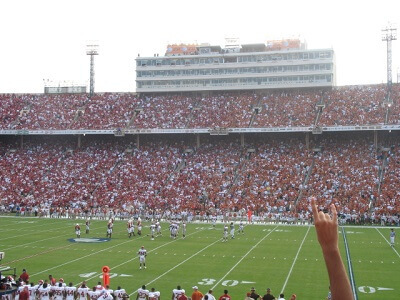 The Cotton Bowl is a much anticipated annual event that allows two top college teams to face off against one another. Founded in 1937, the event is held at AT&T Stadium, which is located in Arlington, Texas. The teams that compete change from year to year, but usually the hosting team is part of the Big 12 Conference and the opposing team belongs to the Southeastern Conference of the NCAA. Normally, the Cotton Bowl is held on January 1, but you can find out the specific dates of the next one above. Follow the links to buy Cotton Bowl tickets online.